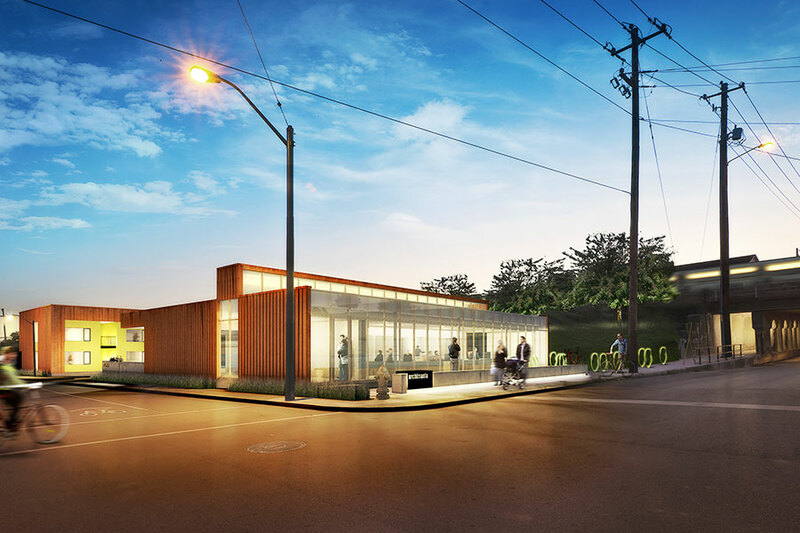 Local firm archimania is building Tennessee’s first net-zero office building. The complex, which includes a six-unit apartment building, is intended to carry downtown’s energy further south. In Memphis, there’s nothing quite as fantastical as Bass Pro Shops at the Pyramid, a 35-story riverfront sports arena converted into a complex that is a unique interpretation of mixed use. Upon waking up in Big Cypress Lodge, the hunting cabin–themed hotel, visitors can go bowling in newly-purchased camouflage print bathrobes, practice sharpshooting at two indoor ranges, or take in panoramic views of the cityscape from an observation deck 300 feet high, accessible by a ride in North America’s tallest freestanding elevator. Below, visitors can shop for speedboats—if you buy one, the staff will float it into the Mississippi River for you. It is an apt example of the diverse, large-scale projects currently cropping up in Memphis. Not surprisingly, there’s more to the city than self-contained shopping and entertainment zones. A 2014 study by Portland, Oregon–based think tank City Observatory found that along with those of New York, Chicago, New Orleans, and Washington, D.C., the Memphis metro area was one of only five of 51 metro areas over a 40-year period with five or more “rebounding” neighborhoods—areas that experienced drastic declines in poverty rates. With everyone focusing on the downsides of gentrification from San Francisco to Boston, what could this finding tell us about Memphis? Three Fortune 500 companies—FedEx, AutoZone, and International Paper—are headquartered there and St. Jude Children’s Research Hospital and the University of Memphis are longtime civic anchors. Elvis, the blues, and barbecue perennially attract tourists. Adaptive reuse flourishes downtown. Last April marked the grand opening of the aforementioned Bass Pro Shops at the Pyramid. A local developer, the Henry Turley Company, is directing a $53 million partial conversion of Central Station—currently an active Amtrak stop—into a restaurant, a movie theater, apartments, and a boutique hotel. The historic Chisca Hotel was transformed into an apartment building last year, and developer Billy Orgel’s Tennessee Brewery will open to residents and businesses in late 2016. The Downtown Memphis Commission, an independent development agency, facilitates many of these projects. In Binghampton, about five miles from downtown, the Broad Avenue Arts District is a notable example of an arts-based corridor revitalization. 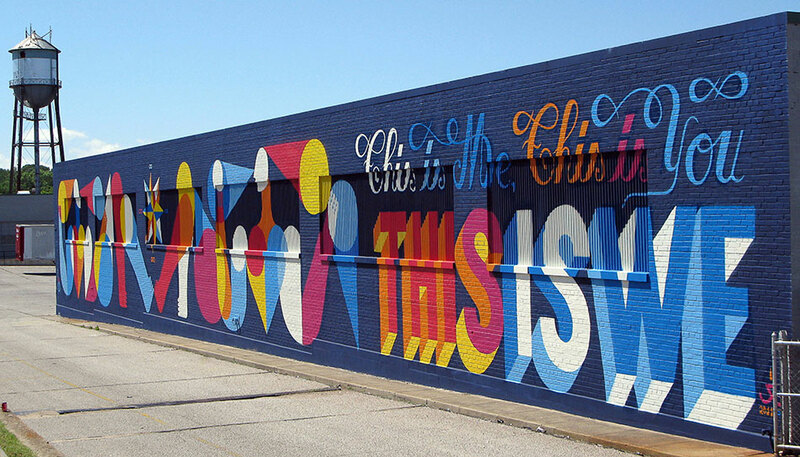 Guillaume Alby’s mural, This is We, faces a half-mile-long strip of galleries, restaurants, bars, and boutiques—businesses that often signal successful culture-based reinvestment. What does small-scale urban investment look like in Memphis, and how does it relate to the city at large? Of the six rebounding neighborhoods in the Memphis metro area, only one is in the dense, older urban core—the South Main Arts District. There, local firm archimania is building the first net-zero office in Tennessee and a residential complex to enliven a downtown corner. These changes are not isolated: Four miles northeast in Crosstown, an old Sears distribution center is turning into an ambitious mixed-use, “health and well-being complex.” And at Memphis’s easternmost edge, Shelby Farms Park is undergoing a dramatic 20-year transformation that will tie it securely to surrounding communities. Memphis asks the same question as many other cities: When certain districts come back strong, despite an overall climate of disinvestment, how does this affect the entire city? “We are in a growth period, and I don’t think it’s just because of the economy,” said principal Barry Alan Yoakum, referring to his firm, archimania, but he could have been talking about the excitement around new development in the city as a whole. Based in prime downtown Memphis, the firm is currently building itself a mixed-use, net-zero office complex eight blocks south of its current location. Founded in Memphis in 1995, archimania is committed to revitalizing downtown. The firm purchased an awkward, 30,000-square-foot piece of land “for next to nothing” at East Carolina Avenue and South Main Street five years ago. Despite its prime location, the property was a challenge to develop, with 12 feet of infill and an AT&T line running through the center. To prime the site, archimania lowered the line and brought the property level with the sidewalk. Crosstown Concourse, a $200 million, mixed-use redevelopment of a former Sears distribution center, will invigorate Memphis’s Crosstown neighborhood. This is Richardson’s first foray into development. Crosstown Concourse “is really a civic project,” he explained. The idea came about six years ago as an outgrowth of Crosstown Arts, a community-based nonprofit that Richardson cofounded with Christopher Miner in 2010. Building on the city’s rich arts and music history, Crosstown Arts staged hundreds of events, exhibitions, lectures, and performances to start conversations about the changes that could happen in Memphis. The surrounding urban fabric is strong. Crosstown Concourse is bound on three sides by historic districts. It’s close to Overton Park, home to Memphis College of Art and the Memphis Zoo. Crosstown Concourse’s section depicts an extraordinary range of uses. 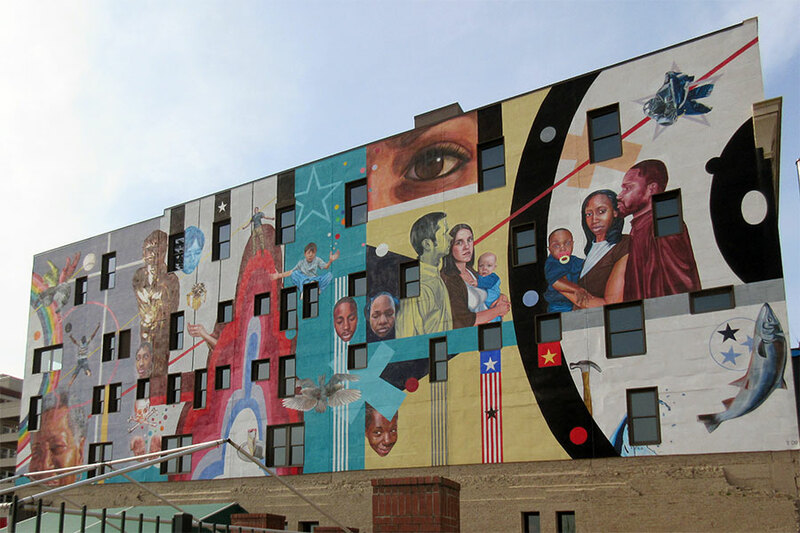 Public art and community-based arts programming share space with a charter high school, restaurants, 265 apartments, and 620,000 square feet of commercial space. The scale of the project—large—matches that of the city. Richardson emphasized that the 1.5-million-square-foot deco and art moderne structure, built in 1927, “is a real icon in Memphis.” The ten-story, three-square-block distribution center stands sentry over Crosstown, a neighborhood of low-slung homes and strip malls. At its peak, Sears employed 1,500 workers in the distribution center and retail store before closing the facility in 1993. Richardson saw a need for a signature revitalization initiative that would get the neighborhood and the city excited. His eclectic team of fifty—architects, developers, business owners, activists, and financiers—want Crosstown Concourse to “put the neighborhood back on the mental map of Memphis.” Local architects Looney Ricks Kiss and Vancouver, Canada–based Dialog are collaborating on the project. Community institutions like the Church Health Center and St. Jude contributed to the development in its nascent stages, investing both for the project’s quality and its spirit of civic engagement. Others followed the anchors: 550,000 square feet of commercial space is already leased. With the development slated to open in 2017, the City of Memphis estimates that it will create 800 jobs and generate $37 million in new wages per year. 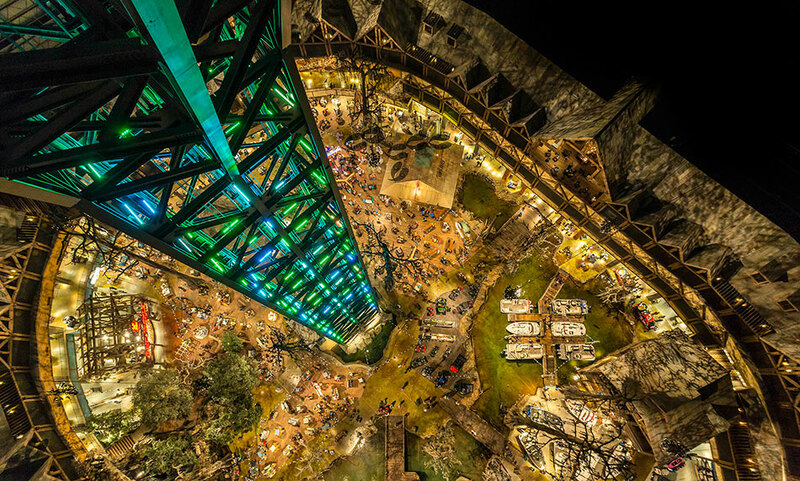 From North America’s tallest freestanding elevator in the Bass Pro Shops at the Pyramid, Designed by local firm o t marshall architects, it’s possible to see the speedboat shop, ponds stocked with live alligators, cypresses shrouded in Spanish moss, and Big Cypress Lodge, the rustic hunting cabin–themed hotel encircling the pyramid’s perimeter. About 3,000 people are expected to pass through the building each day. For the development team, “density is a welcome by-product” of mixed-use, but the real driver is promoting diverse functions that work well together. Following the anchors, the structure is programmed for a 150,000-square-foot wellness center, a charter high school, and an arts area. Floors seven through ten feature 265 loft-style apartments, and 620,000 square feet of offices are spread over floors two through six. The ground floor boasts 60,000 square feet of restaurant and retail opportunities. Adaptive reuse can be expensive. Crosstown Concourse costs $9 million more than the lavishly kitsch Bass Pro Shops at the Pyramid. The project received funding from 21 sources, including historic preservation tax credits. A relatively small proportion of the street-level floor is reserved for commercial businesses to spur retail development in the surrounding neighborhood. There’s a spillover effect already, Richardson said, citing a spate of restaurant openings close to the site. 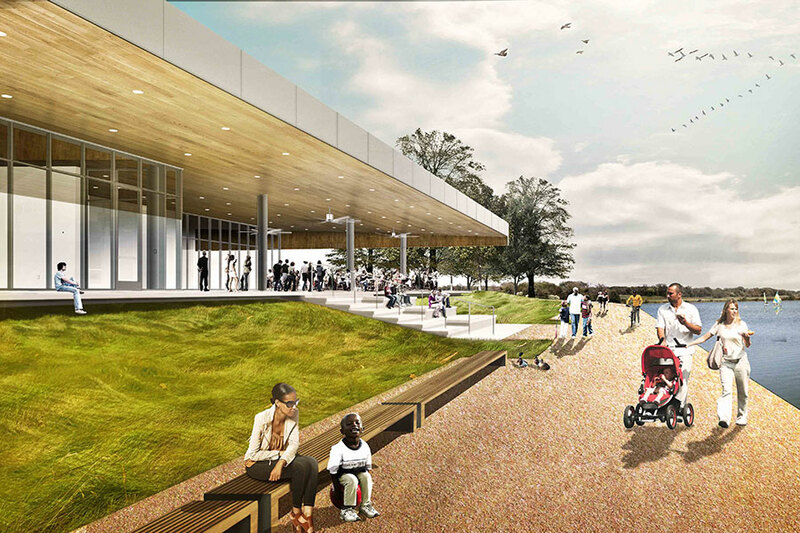 James Corner Field Operations is spearheading a 20-year master plan for Shelby Farms Park, Memphis’s largest green space. Marlon Blackwell Architects of Fayetteville, Arkansas, designed outbuildings to activate space in the park’s core. 652,050 Memphians fan out over an area bigger than New York City. Despite Memphis’s size, the six lane roads and highways that slice through the city cut the drive from its eastern edge to the banks of the Mississippi River on its western edge to less than 30 minutes. Twelve miles east of downtown, Shelby Farms Park is Memphis’s largest natural feature aside from the Mississippi. The 4,500-acre green space (almost five times the size of Manhattan’s Central Park) sits on the city’s outskirts, though around one million people live within a twenty-minute drive. 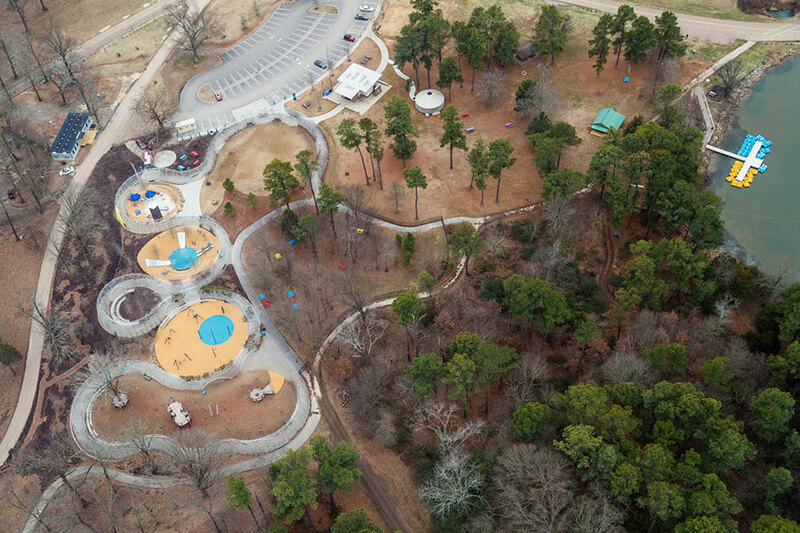 The park is now undergoing a total renovation with new facilities by Fayetteville, Arkansas–based Marlon Blackwell Architects (MBA) and a master plan by New York’s James Corner Field Operations. Acquired by Memphis through annexation in 1973, present-day Shelby Farms Park has a strange past. From 1825 to 1828, some of the land that the park now occupies was the Nashoba Community, a utopian settlement that educated and emancipated slaves. One hundred years later, the commune was converted into a penal farm that ran through the mid-1960s. The boathouse opens out onto 80-acre Patriot Lake, a recreational focal point at the heart of the park. Shelby Farms Park was transformed into its present recreation-oriented program in the 1970s, though the space hosts more diverse activities than a typical city park. Agricenter, the self-anointed “Versailles of American agricultural technology” and the region’s largest urban farm, is building on the penal farm’s legacy of progressive farming and education, operating on 1,000 acres in the southeast corner of the park. Its buffalo herd is a crowd favorite. Shelby Farms Park Conservancy (SFPC), the park stewards, commissioned Field Operations to develop a roughly 20-year master plan in 2008. 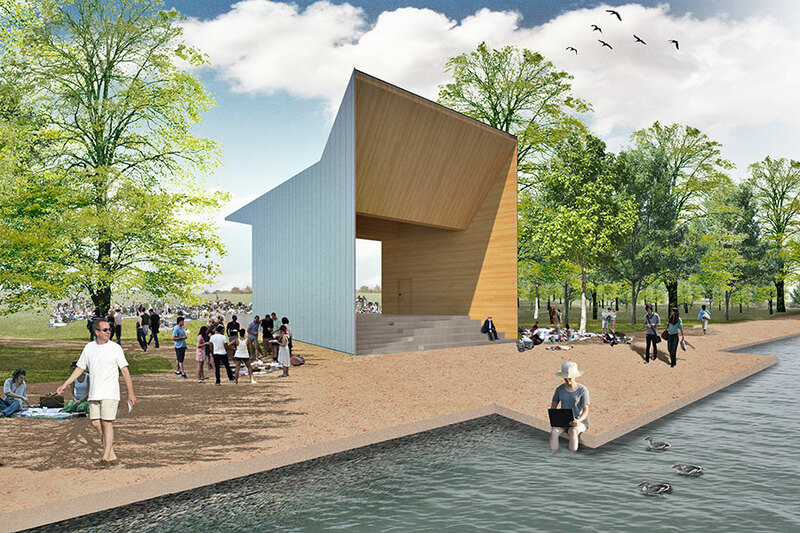 Primary goals of the $70 million project include creating an identity for Shelby Farms Park; connecting the park to the city and surrounding county via infrastructure improvements and better way-finding; promoting biodiversity; and improving recreational facilities. Field Operations divided the park into 12 “landscape rooms,” such as orchards and berry fields, fishing ponds, and areas for horseback riding and agricultural development. Signature projects like the Wolf River pedestrian bridge, the Shelby Farms Greenline, and the Woodland Discovery Playground are already complete. Fifty-two-acre Patriot Lake will be expanded to 80 acres; plans call for planting one million trees. Much of the facelift focuses on the Heart of the Park, a central recreation area anchored by Patriot Lake. Currently under construction, these upgrades will open to the public this fall. 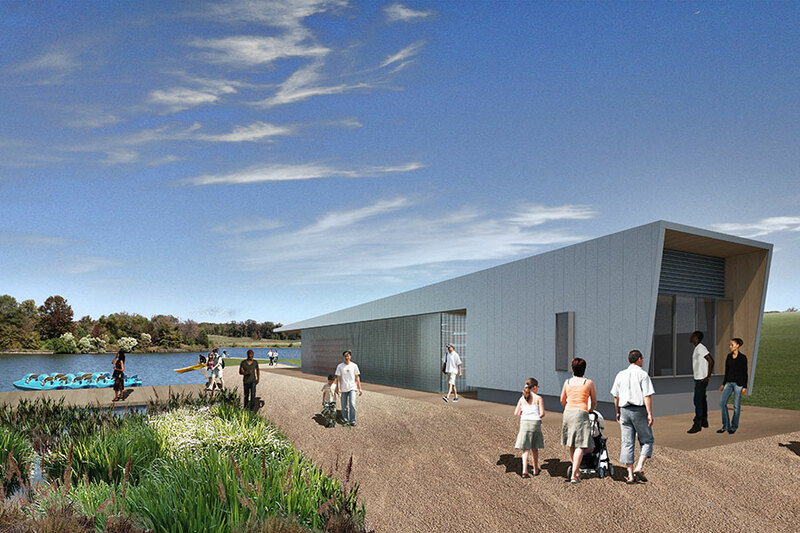 MBA designed four main structures to reactivate the core, a visitor’s center, a boathouse, an amphitheater for concerts on shore or films facing the lake, and a retreat center–restaurant, as well as lakeside pavilions. The center has an “ag-tech” aesthetic, explained project designer Stephen Reyenga. Referencing downtown’s orientation toward the river, the west-facing porch “frames the view out toward the lake.” The design incorporates local material where possible: The porch roof is Tennessee cypress; the stone is quarried from Arkansas. The restaurant tenant will be a branch of The Kitchen, the Denver-based nonprofit and upscale farm-to-table restaurant. The Shelby Farms Park master plan is being implemented in phases. A central element of the Field Operations–designed Woodland Discovery Playground, completed in 2011, is a winding arbor planted with native trees and vines that demarcates the space’s six play areas. New developments like these three can have a trickle-down effect by spreading prosperity, especially in disinvested areas. Optimism sustains urban revitalization. Archimania, Todd Richardson, and SFPC justifiably believe in the transformational potential of civic-minded changes. The enthusiasm surrounding these three developments is palpable across Memphis. Citywide, trends are encouraging: Downtown residential occupancy rates are at 95 percent. The Broad Avenue Arts District and the remediation of Overton Square were cited by many during AN’s visit as examples of successful corridor revitalization. Archimania’s complex should activate a southern corner of downtown, Crosstown Concourse may spur significant redevelopment, and Shelby Farms Park will likely broaden access to better public space. Quality amenities can anchor a neighborhood: These projects are bright spots on city terrain marked by persistent disinvestment. They should be praised for their intent and watched closely for their outcomes. Although famous for its musical contributions, Memphis has strong public art citywide. Since its founding in 1997, the UrbanArt Commission has completed over 140 projects, often in collaboration with community groups. Downtown, Jeff Zimmerman’s A Note for Hope (2008) overlooks AutoZone Park, home of the AAA Memphis Redbirds. Long after the closing of the frontier, American cities still absorb collective fantasies of transformation. Until recently, Memphis left the door ajar: While most 19th-century cities closed their borders, Memphis grew by annexation into the 2000s. Suburbia, though, accounts for most of metro Memphis’s rebound. Five of six rebounding neighborhoods are located outside the core downtown or in West Memphis, Arkansas. Declines in poverty rates may not be the result of new investment and opportunities for residents: The research is unable to determine whether residents in rebounding areas are getting wealthier, or whether there is an influx of people with higher incomes. Particularly in the South, Cortright noted, rebounding neighborhoods tend to be on the periphery of the metro area where formerly rural areas were developed into suburbs. Architecture alone is not equipped to attack structural problems. Beyond neighborhood-level transformation, there’s a limit to what a few signature projects can do to reverse the fortunes of a struggling city. For two years in a row, Memphis has had the highest poverty rate of any metro area of more than one million people—almost double the national average of 15 percent. Tom Jones, a consultant and blogger at Smart City Memphis, notes that there are more people living in poverty here than the entire population of Chattanooga. While gentrification dominates the conversation in large metropolises, the effects of concentrated poverty, not gentrification, are the greatest challenge for most cities. When sprawl and entrenched poverty are prevailing conditions, what constitutes successful urban revitalization? At what scale? These questions can be asked not just in Memphis, but St. Louis, Atlanta, Detroit, and many other lower-density, high-poverty cities that are nevertheless experiencing reinvestment in targeted areas.